Movement is a vivid discovery, a fundamental and explicit teaching in which the return to basics takes on a whole new meaning. 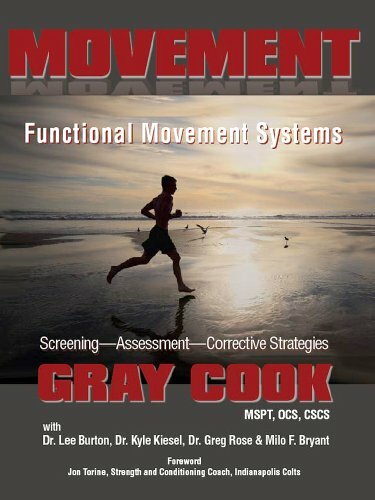 In it, author Gray Cook crosses the lines between rehabilitation, conditioning and fitness, providing a clear model and a common language under which fitness and rehabilitation professionals can work together. By using systematic logic and revisiting the natural developmental principals all infants employ as they learn to walk, run and climb, Gray forces a new look at motor learning, corrective exercise and modern conditioning practices. This book is not simply about the anatomy of moving structures. Rather, it serves a broader purpose to help the reader understand authentic human movement, and how the brain and body create and learn movement patterns. Our modern dysfunctions are a product of our isolated and incomplete approaches to exercise imposed on our sedentary lifestyles. A return to movement principles can create a more comprehensive exercise and rehabilitation model, a model that starts with movement.